No one likes to play communication tag with their contacts when they’re trying to get things done. That’s why Microsoft developed Bookings, an appointment scheduling service that allows clients to schedule appointments with you, even when you’re not around to answer that email or phone call. 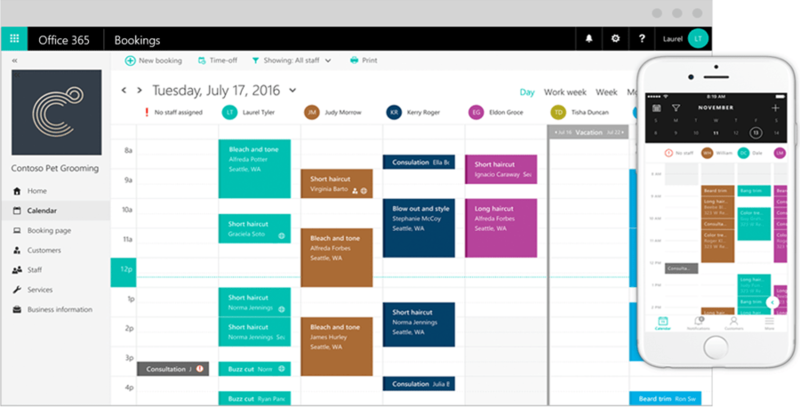 Bookings, a service in the Office 365 suite, provides businesses with customized self-service scheduling. A client is given visibility over the times you’re available to meet with them and they can easily book an appointment via the web page on any device. All bookings can be viewed on a centralized booking calendar that provides visibility across your whole team. Bookings can be easily managed, reassigned, or rescheduled within the calendar, and it even works on mobile. Microsoft even took into account the “schedule and forget” mentality that can happen to us all when we get busy. After an appointment or meeting is set, you’ll automatically receive reminders and updates regarding your booking. If you can’t make it to your time because something came up, Bookings makes it easy to cancel right from your reminder email or calendar. Canceling will even bring you back to the web page where you can easily reschedule. So when Bob from accounting really needs that report and you have to drop everything to work on it, both you and the person you’re meeting with can rest easy knowing no-shows won’t be a problem. Businesses are given complete control over how much notice is required to cancel an appointment. This means you won’t have to worry about that last minute cancellation as you’re already on the way to the client. Just when we thought Bookings couldn’t get any better, it was announced today that Bookings can be completely integrated with your company’s Facebook business page. Customers will now be able to look up a business on Facebook, and with just one click of a button schedule an appointment or meeting. Facebook will even auto-populate contact information based on their profile. It’s never been easier to make an appointment! All of the preferences from Bookings will translate to Facebook, so cancellation times, reminder preferences, and more will work exactly the same as the appointments made through the custom web page. The only limitation is how far ahead you can book your appointment. If you want to meet more than 2 months in the future, you’re going to have to go through the web page instead. Office 365’s services just keep getting better, and we can’t wait to see what Microsoft has in store for us next. If you’d like to learn more about how your business can take advantage of Bookings and all the other great services included in Office 365, simply fill out the contact form below and one of our experts will be in touch.